On a walk through woods, fields or conservation land, Russ Cohen sees edible food where the rest of us might only see bushes and greenery. He finds wild plums and grapes; hazelnuts and chestnuts; wild parsnips and watercress; even some fruits and greens most people have never heard of, like toothwort—a root with a horseradish flavor—or nannyberry, a prune-like fruit that ripens in September. If you’ve ever foraged for wild foods in and around Boston or signed up for an edible plants walk, you most likely know the name Russ Cohen. He is the area’s leading wild edibles expert, and has led weekend and seasonal walks throughout Massachusetts and New England for the past 45 years. Before retiring three years ago from what he called his “day job” as a lawyer protecting rivers for the Massachusetts Division of Fish and Game, Cohen embarked on a new mission: to plant wild edibles in as many places as possible so more people can “nibble in nature.” He is a modern Johnny Appleseed of sorts, but instead of promoting apples, he’s traveling around Massachusetts and New England planting native edibles along the seashores and near woods, in partnership with open space landowners and managers. He does these plantings for free, as his way of giving back to Mother Nature for all the years he has enjoyed foraging and eating off the land. “I wanted to return the favor and help make the landscape more edible,” the Arlington resident says. He decided to set aside some of the nuts he gathered to grow into shagbark seedlings. He shared viable nuts with anyone interested in planting them. He also encouraged Fedco, a Maine-based seed company specializing in cold-weather trees and plants for the Northeast, to carry the shagbark hickory and sent them a bagful of wild nuts to start with. Fedco’s catalog soon announced a new addition, the shagbark hickory, “one of our most beautiful native nut trees,” with credit to Russ Cohen. After a few more similar experiences, he says, “a mist cleared” and his Johnny Appleseed mission emerged. 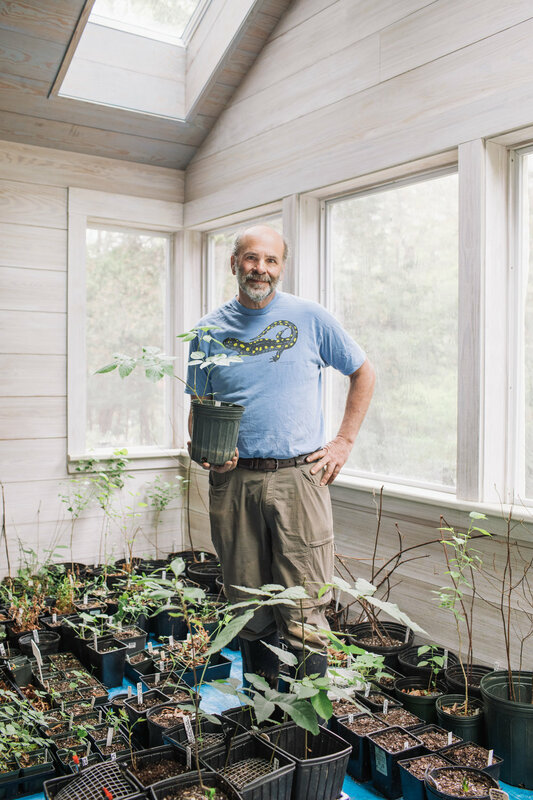 Since then, he’s completed nearly 20 major wild planting projects, from Essex County to Sudbury, as well as in New Hampshire and Maine. That’s pretty much been his motto since high school when he was introduced to edible botany through a mini course taught by his Weston High School biology teacher. “That was the spark that ignited the lifelong passion I have,” he notes. He quickly headed to the library and learned about 70 more edibles. By his senior year, Cohen was leading the class, and introducing students to sheep sorrel, dandelion, chicory, burdock and winter cress growing in the schoolyard. Since then, he’s been running between 20 and 50 foraging programs and lectures each year and even authored a foraging book called Wild Plants I Have Known and Eaten. In 1774, John Chapman was also about 18 when he set out from his native Massachusetts to the Ohio Territory frontier with a messianic mission of helping spread apple trees and orchards throughout what is now Indiana, Ohio and Pennsylvania. Chapman, or Johnny Appleseed as he became known, was a charismatic and eccentric guy who wore a tin pail cap and did some preaching as well. Cohen, now 61, has a similar zeal, but proceeds in a quieter, less flamboyant manner. “We’re both kind of catalysts that help make things happen,” Cohen muses. “I feel a deep spiritual connection to what I’m doing, but outside of that I’m basically an atheist, I’m a nature worshipper.” He’s also never been interested in making money off his interest, and has turned down chefs seeking a forager to collect mushrooms, ramps or the latest food trend. He’s seen these fads—like that of using elderberry blossoms used to create an elderflower liqueur like St-Germain—lead to over-picking to the point of local extinction. Though the end goal is always adding edible wild natives, each of Cohen’s projects evolves differently and gets different plants depending on location. Some he completes in conjunction with organizations that manage open spaces and conservation areas, some in areas where he’s offered edible walks in the past. In the meantime, Cohen is always on the lookout for good foraging spots, and he recommends unkempt “edges” of places, like soccer fields, ponds, pathways, former railroads and power lines and especially organic farms (with the manager or owner’s permission). “In general, places with good sun exposure are prime locations for foraging,” he says. The Cox Reservation on the North Shore is one such spot. In addition to stunning scenic overviews of the Essex River watershed, its 26 preserved acres consist of open fields, riverfront and salt marsh, farmland and patches of woods where visitors can canoe or kayak, hike, picnic and forage. Cohen’s led a number of walks there over the years, and says he has a long and friendly relationship with the overseer, the Essex County Greenbelt Association. When he asked about planting native edible species to supplement the edible plants already there, they gave him the thumbs up. 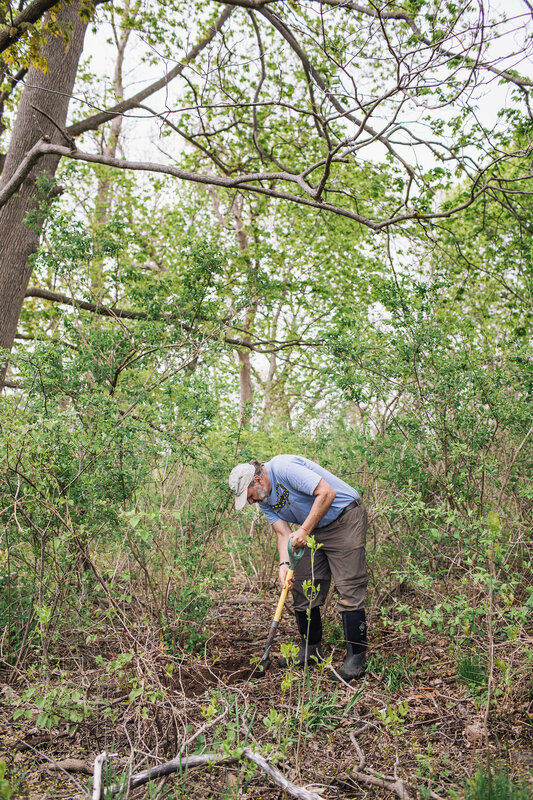 He chose to plant Juneberry at the Cox Reservation, for example, because the early blooming shrub or small tree typically grows along rivers or streams. They bear reddish-purple berries that ripen in June, delicious in pies, muffins and other baked treats. Native Americans also sought the Juneberry to make an early “energy bar.” They combined dried Juneberry with dried meat, fat and nuts in a portable, easy-to-eat bar they called pemmican. “Almost everything that’s native and edible the Native Americans figured out and ate,” says Cohen. Early American settlers then learned about these plants from Native Americans. The groundnut, for example, a tuber similar to a potato that Cohen grows from seed and replants in the wild, became a critical supplemental food for the Pilgrims for its starch and protein. 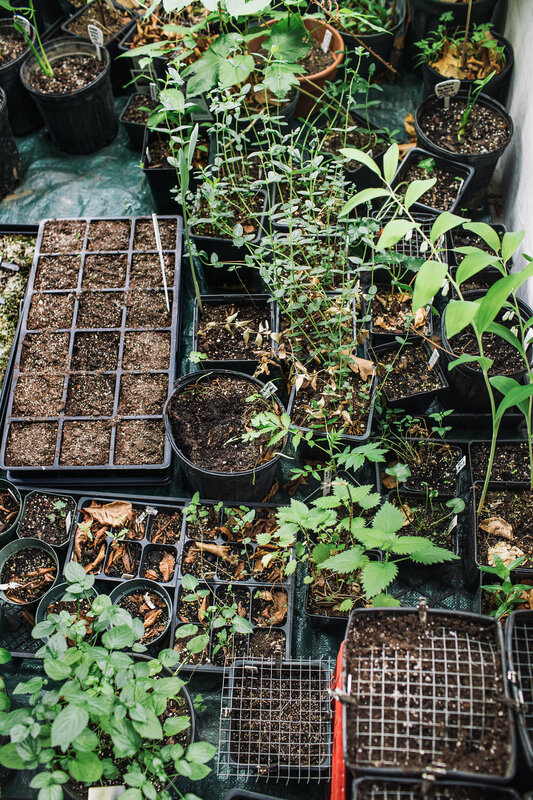 Native plants, he says, often have a good chance of surviving after planting and offer diversification and ecological value to both area wildlife and pollinators. “I’m kind of hoping the plants I add to the landscape blend in like they’ve always been there,” Cohen says. At other projects, like Willard’s Woods in Lexington, those overseeing the land get involved and even chip in. When Cohen made a proposal for wild plantings at this 100-acre former farm site with three miles of trails, the town of Lexington not only agreed, but also contributed some money left in a budget for additional plantings, especially to supplant invasive plants. New plants added included flowering raspberries, blueberries, wild raisins and hazelnut trees, among others. Cohen notes that Willard’s Woods was already a good spot for foragers, especially for picking wild black walnuts in the fall. Not all the spots Cohen plants allow foraging, but that still doesn’t stop him. 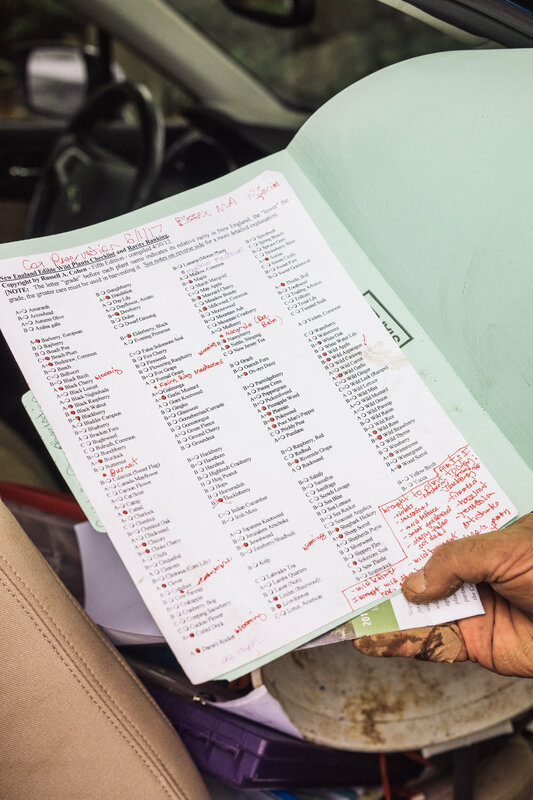 When he approached Mass Audubon’s Drumlin Farm in Lincoln, Cohen already knew the site had about 40 species of wild plants from previously led edible walks. “I noticed your landscape would be suitable to add some additional native plants that would be compatible with what’s already there,” he told them. In the end, some three dozen plants were added, including sassafras, marsh marigold, fiddlehead fern, groundnuts and sweet Cicily. And long after he’s gone, Cohen’s legacy of plantings as an investment in the future will live on. Whether his name becomes as well known as Johnny Appleseed’s remains to be seen, but he has a good shot at it. This recipe by Russ Cohen works equally well with fresh, frozen or dried Juneberries. If using dried berries, soak first in hot fruit juice until softened. It is also OK to substitute other fruit such as blueberries, raspberries or cranberries in this recipe. The flavor and texture of the muffins will differ somewhat depending on the type of berries you use, but the results are likely to be just as tasty. Combine oats and buttermilk in a small bowl and let stand to allow the oats to soften. Preheat the oven to 400°F. Grease muffin tins. Combine flour, baking powder, baking soda and brown sugar, and stir well. Mix together the beaten egg and melted butter. Add oat/milk mixture to the dry ingredients and stir just until all ingredients are moistened (do not overmix). Fold in the Juneberries. Fill muffin tins ¾ full. Bake for 17–22 minutes, until muffin tops turn golden brown.